Hasty coding, error prone. No backups, data loss. Company for sale. This was inspired by the recent spate of stories I’ve heard about companies that have failed because they did not properly manage their data and databases. My first Simple-Talk article was published yesterday! I’m pretty excited about it and wanted to share the link. In the article, I give an overview of how clustered and nonclustered indexes work, and I demonstrate why clustered index best practices — narrow, unique, static, and ever-increasing — are important design considerations. This blog post is brought to you by the awesomeness that is the SQL Server Twitter community. Contributions were made by several awesome Tweeples, including Denny Cherry, Kendra Little, Ken Simmons, and Magnus Ahlkvist, among others. Regardless the reason, I needed to do some conversions. Denny shared with us the msdb.dbo.agent_datetime function to convert run_date and run_time into an actual datetime value. I have to say, this certainly cleans up the code quite a bit! Then Magnus shared a method to convert run_duration into seconds, which he modified from a script on SQLServerCentral. I was able to use these two tidbits to update my old script. You can now run this script to get back a list of all enabled procs, a script that will disable them, a breakdown of the schedule, and a historical run-time average. /*  How many days do you want to include in your run-time average? If this doesn’t do exactly what you want, check out SQLJobVis, which Ken recommended. It’s a free tool that helps visualize the job history of SQL jobs. Today I had to run an ad hoc query on a 8.5 billion row table. The table had a dozen columns of a variety of data types and was clustered on a bigint identity. There were no other indexes on the table. My query involved a join to a smaller table with a date range restriction. Without an adequate index to use, SQL Server was going to be forced to scan this 8.5 billion row table. Now, I don’t have much patience for waiting for long running queries. I want to run the ad hoc, e-mail the results, and forget about it. But short of adding a nonclustered index, which would take a very long time to build and probably require additional space requisitioned from the SAN team, what could I do? Enter disposable indexes. Now, you might be asking yourself, “What the frilly heck does she mean by a disposable index? Is that new in Denali?” No, dear reader. 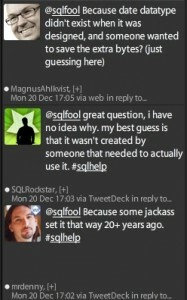 I am actually referring to filtered indexes, which is available in SQL Server 2008 and 2008 R2. I call them “disposable” because I create them to significantly speed up ad hoc queries, then I drop them when I’m done. Here, allow me to demonstrate using the AdventureWorks2008R2 database. Although the tables are smaller, this query is very similar in structure to what I needed to run today. Okay, SalesOrderDetailID 75000 takes us back to 12/27/2007. That’s close enough to 1/1/2008 for my purposes. Of course, depending on the size of the table, in real life it may make sense to try to get closer to the value you’re looking for. But for now, this will do. And because we’re looking for data through the “current date” (7/31/2008 in the AdventureWorks2008R2 database), we already know our outer limit is 121317. By having this range identified, SQL Server can perform a seek on the clustered index to create the nonclustered index on just the subset of records that you need for your query. Remember that 8.5 billion row table I mentioned earlier? I was able to create a filtered index that covered my query in 10 seconds. Yes, that’s right… 10 SECONDS. The last thing we need to do is include our filtered index definition in our ad hoc query to ensure that the filtered index is used. It also doesn’t hurt to explicitly tell SQL Server to use the filtered index if you’re absolutely sure it’s the best index for the job. Not attending PASS Summit? Watch LIVE streaming events FOR FREE! If you’ve not yet heard, the annual PASS Summit is less than 2 weeks away. This is the largest SQL Server and Business Intelligence conference _in the world_, sponsored by Microsoft and Dell. The return on investment of attending this conference is pretty huge, and I highly recommend you attend if you can swing it. This year, PASS has decided to try something new. A daily Lightning Talk session will be held where speakers present for 5 quick minutes on interesting SQL topics. I’ll be presenting on Tuesday with 6 amazingly talented speakers. My topic is page compression — what is it, how to do it, and (most importantly, of course) how it affects performance. You can click the link above to read my abstract, but in short, I’ll be taking attendees on a journey through indexes. You’ll come away with a much better understanding of the internal structures of indexes, which should help DBA’s with database design and performance tuning. If you’re not able to attend in person, Summit does sell DVD’s of the event afterwards, which are well worth the investment. But this year, to make the event more accessible to the community, PASS and Dell have teamed up to present live streaming of the keynotes and WIT luncheon sessions. Ted Kummert, Senior Vice President of the Business Platform Division at Microsoft Corp., will kick off PASS Summit on November 9 by highlighting the continued innovation across Microsoft’s business and information platform. Kummert will explore Microsoft’s key technical investments, as well as Mission Critical applications and the accessibility of Business Intelligence. Quentin Clark, General Manager of Database Systems Group at Microsoft Corp., will showcase the next version of SQL Server on November 10 and will share how features in this upcoming product milestone continue to deliver on Microsoft’s Information Platform vision. Clark will also demonstrate how developers can leverage new industry-leading tools with powerful features for data developers and a unified database development experience. David DeWitt, Technical Fellow, Data and Storage Platform Division at Microsoft Corp., will be discussing SQL query optimization and address why it is difficult to always execute good plans in his highly anticipated technical keynote. DeWitt will also cover new technologies that offer the promise of better plans in future releases of SQL Server. While all of the keynotes are interesting and definitely worth watching, I cannot recommend the David DeWitt keynote more highly. His keynote last Summit was outstanding. It was technical, thought provoking, and one of the best things of last year’s Summit. Table-valued parameters (TVP) are a great feature that was new in SQL Server 2008 that allow you to insert a dataset into a table. Previously, the most common way of doing this was by passing and parsing XML. As I’ve previously posted, TVP’s perform an astounding 94% faster than singleton inserts and 75% faster than XML inserts. But for some reason, TVP’s still aren’t widely used and understood. In this post, I’ll walk you through how to use these and how to query the metadata for TVP’s. Now that we’ve successfully created a couple of table types to support our TVP’s, how do we go back and find out which objects we’ve created? You can query the sys.types catalog view to find out. Just search for system_type_id 243, which identifies the record as a table type. Even better yet, you can use the sys.table_types catalog view. This gives us the same information as sys.types but also gives us the type_table_object_id, which we’ll need shortly. What if you need to look up the table type definition? You can do this using the type_table_object_id and joining to sys.columns. And last, but certainly not least, how do we see if any procs are currently using the table types? SQL Server 2008 makes this easy for us with the sys.dm_sql_referencing_entities DMV. If you’re wondering how to implement SQL Server TVP’s in your .NET code, well… I can’t tell you how to do it, but I can point you to a place that can. Stephen Forte has a post that explains how easy it is to do. Ever need to rename all objects in a database? Yeah, okay… it doesn’t happen very often, but when it does, it can be time consuming. This recently came up as something I needed to do. When you consider all the tables involved and you add in defaults, indexes, and foreign keys, well… you can imagine how the number of objects adds up quickly. After doing a few tedious renames, it occurred to me that I could write a script to generate the rename scripts for me. Work smarter, not harder, right? For anyone interested, here’s the script.